A few years ago I started playing with Apache’s OpenNLP project. I’m a big fan of the Apache foundation and their libraries, but I found myself very frustrated by OpenNLP’s lack of documentation and the hacky-feeling interfaces the library exposed. 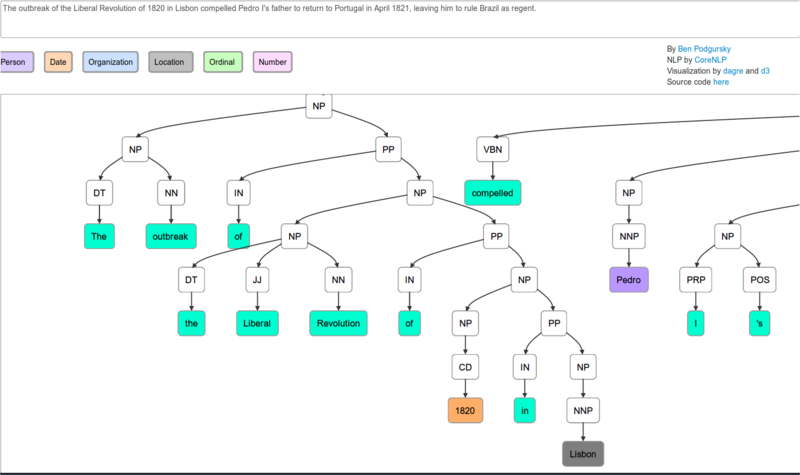 However recently I took another look at the available NLP libraries and came across Stanford’s CoreNLP project. CoreNLP, as it turns out, is an awesome project, and it took almost zero effort to get their example demo working. When I have time to work with the two libraries a bit more I’ll hopefully update with something more interesting. Great stuff. The link in “I’ve been referencing this as a complete token list. )” isn’t working. Thanks, I swapped in a link that should work. Thanks for the post, I’d really like to be able to view the d3 example and see the source for it. Unfortunately the link “here” is not working. Thanks, fixed. Also, the source is all here https://github.com/bpodgursky/nlpviz even if the link dies in the future. Looks great! Please could you make the test link work again at http://nlpviz.bpodgursky.com/ ? The example link was still now working. Can you please fix it? Restarted the example, but you should still be able to run it yourself.